To many young kids, figure skating is an appealing sport. They see competitive skaters doing beautiful jumps, twists, spins, and landings and become intrigued with the idea of being able to perform those skills, as well. As a parent, you might be wondering how to get your child started in the figure skating world and you start researching local ice arenas, talking to instructors, and looking into quality ice skates. You’ll find that children will often start by being put in Snowplow Sam classes. As your child progresses, they will move along in the levels of figure skating rather than be put into age group classes. Though it all might seem confusing now, the levels and structure is an integral part of figure skating and will soon be second nature! The Snowplow Sam levels are introductory classes divided into three levels allowing children with no prior skating experience to build confidence while learning the basic skills of skating. At most arenas, these classes will be taught in a safe and positive environment, incorporating fun and games making class time an enjoyable experience for all. After completion of the Snowplow Sam levels, your child will likely move on to the next levels of figure skating. There are eight basic levels outlined by US Figure Skating®. These levels include everything from learning how to glide on the ice to performing a waltz jump. Though, as a parent you see your child learning all of these new skills and progressing, but you have no clue what it is they are actually doing or what the words they use actually mean. We’ve provided a simple guide to figure skating that can give you an understanding of the basics and terminology of the sport. There are many terms used in skating that can be foreign to those who are unfamiliar with the sport, especially if you are a new skater or parent just beginning to dip your feet in the water, or ice as it is. 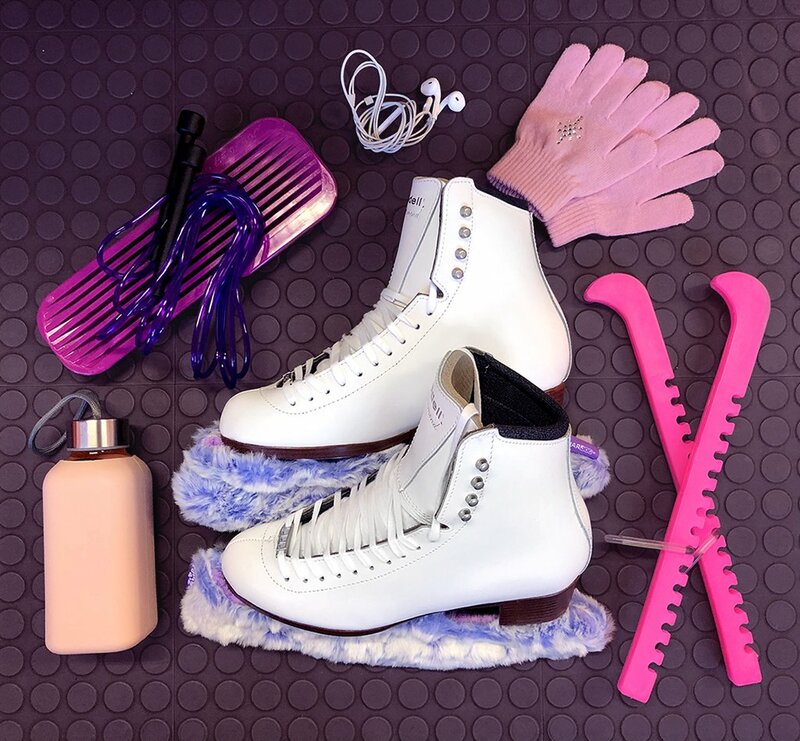 Read on to learn what some of the US Figure Skating® terminology means and how you can help your skater succeed in the sport. Stroking in figure skating is a method of moving forward or backward. The skater alternates pushing off using the inside blade of the skate. Forward stroking means just that. It is the act of moving forward on the ice. It is important to remember to have good posture and form when performing this skill because it is a fundamental skill of all skating. Your body should be upright, with chin up, and your knees bent. Shifting weight forward can cause you to fall, resulting in a possible injury. Backward stroking is more challenging than forward stroking and requires different techniques. The objective in backward stroking for beginners is to balance on the shallow back inside edges and then transfer this skill to glide on the shallow back outside edges. The edges are the two sides of the skate blade on either side of the grooved center. There are inside and outside edges, as well as forward and backward edges, totaling eight altogether. A jump where the skater takes off from the entry edge of the skating foot without bringing the free foot in contact with the ice to assist the takeoff. The Axel, loop, and Salchow are common edge jumps. A glide in figure skating is a one or two-footed movement across the ice, either forward or backward. Crossovers are a method of gaining speed and turning corners in which skaters cross one foot over the other. There are both forward and backward crossovers. There are a multitude of jumps that skaters of all levels can learn. Here are a few you might have heard of. One of the most difficult jumps, which takes off from the forward outside edge and is landed on the back outside edge of the opposite foot. It is the only jump that takes off from a forward position. A toe-pick-assisted jump taken off from the back inside edge of one foot and landed on the back outside edge of the opposite foot. A jump that is listed in the scale of values. Listed jumps are defined by their take off. There are six different types of listed jumps: toe loop, Salchow, loop, flip, Lutz and Axel. Jumps that are not listed in the scale of values and do not count as jump elements which can be used throughout a program to enhance the choreography. Such jumps are typically one revolution or less. A pairs move in which the male partner assists the woman into the air, she then executes one, two, three, or four revolutions and lands skating backward. While there are many more terms in figure skating that you will more than likely encounter, understanding some of the basics can give you the tools to help your skater succeed. Being able to encourage your skater, pick out a quality coach, and help set goals are things that you’ll be able to do when you understand more of what figure skating entails. Stay up-to-date on topics and terminology of figure skating through our blog.